If, like me, you ever find yourself in a situation where you are tired from a long day and need to throw together a healthy dinner in a hurry, then this is the dish for you. 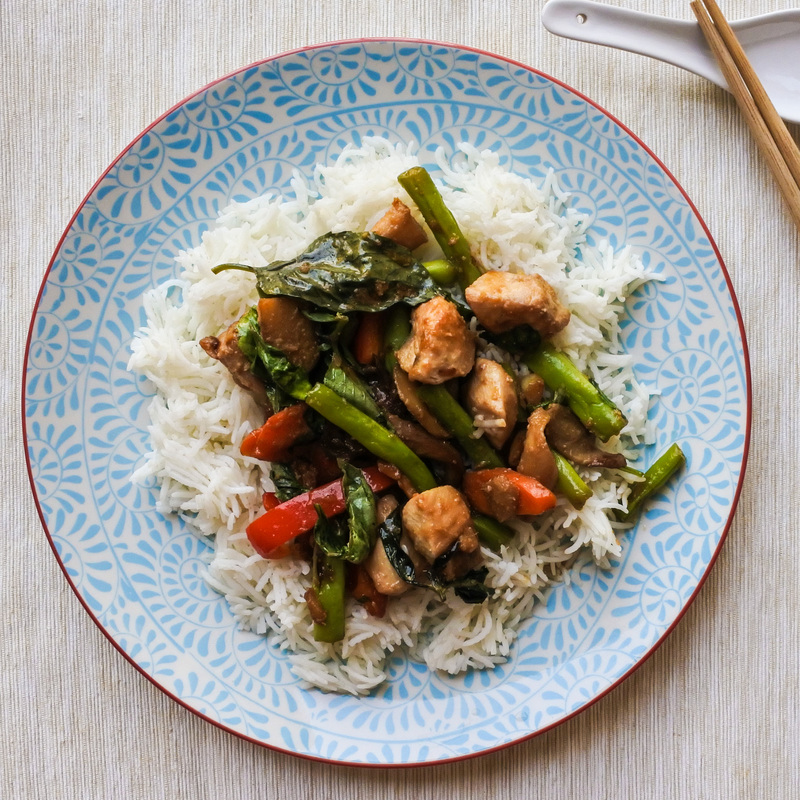 The most time consuming part of this recipe is marinating the chicken and chopping up the veg – small sacrifices when you consider the end result which is a tasty homemade dinner of chicken stir-fry with fresh vegetables. Puree lemongrass, 2 tbsp soy sauce, 3 cloves of garlic, 1 tbsp of sliced ginger and 1 tbsp of oil together. Toss mixture with diced chicken and let marinate for 30 min-1 hour. Meanwhile, wash and cut vegetables into bite sized pieces (about 1 in/2cm long. Slice ginger and remaining garlic cloves. When ready to cook, place a large wok over high heat. When the wok is good and hot, add marinated chicken. Stir-fry until cooked and no longer pink (about 3-5 minutes). Remove chicken and set aside on a plate nearby. Add 1-2 tablespoons of vegetable oil to the same wok and heat over high heat. Add sliced ginger and 2-3 cloves of sliced garlic and stir-fry for a minute or so until fragrant. Next, add the mushrooms and stir fry until browned. Then add sliced carrot and green beans. Stir-fry for 3-4 minutes over high heat then add cooked chicken. Stir-fry together and cook for 1-2 minutes. Add chopped red bell pepper and stir-fry for a minute or so. Turn off heat, add fresh Thai basil, 1 teaspoon of sugar, 1 tbsp of soy sauce and 1 tablespoon of fish sauce. Stir everything together until everything is evenly coated. Cover with a lid and let sit for 2-3 minutes. Then add sliced carrot and green beans. Stir-fry for 3-4 minutes over high heat. Add chicken and stir-fry together and cook for 1-2 minutes.